At one point or another, we’ve all been guilty of snacking in between meals. It isn’t a crime, but when a snack has enough carbs and fat good for one meal, it will break your diet. And if you overeat on a daily basis, eating snacks could become an unhealthy habit that could lead to complications from weight gain. The risk of developing this unhealthy eating habit is also true if you have a tendency to snack while working on your desk. When you’ve been sitting at your desk for hours and for five days straight, you might feel the need to munch on snacks to keep you sated while you work. 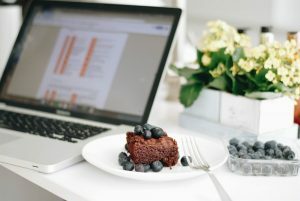 This doesn’t sound like a healthy habit, but with alternative office snacks, you can turn it into a healthier practice that not only sates your cravings but also gives you the nutrients to help you improve your work. Not all food marketed as healthy may be beneficial while you work. Figs, sweet potatoes, and prunes are organic food options, but they are packed with magnesium, a mineral which some people use as a sleeping aid. Eating too much of these might make you feel sluggish and sleepy. That’s why our list features alternative snacks based on the nutrients it provides to help you at work. 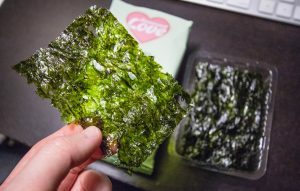 If you like the crunch of chips or crackers, try roasted seaweed snacks. Plain varieties of this snack have a crunchy and salty taste, but there are also special flavors such as sesame, wasabi, sea salt, and more. You can find this at most supermarkets under the international food aisle or in Japanese specialty stores. Seaweed is a low-calorie, high-fiber snack rich in A, C, E, K, and B vitamins, which can help avoid oral and internal diseases. It is also rich in iodine, which may prevent you from feeling fatigue in the workplace. Granola is a healthy substitute for sugar-filled cereals. If you want to buy granola-based products from the supermarket, always check the label: some manufacturers add excessive amounts of sugar, artificial preservatives, and other ingredients you can’t pronounce. Instead, look for those made with organic ingredients such as nuts and fruits. Or instead of pre-packed granola products, buy plain granola, mix it with nuts and berries you like, add low-fat milk, and eat it as a cereal snack. The protein can give you the boost you need to work productively. Just make sure you portion out your servings. That’s right: chocolate can be healthy. 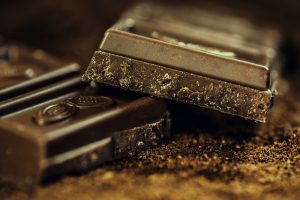 Small servings of dark chocolate with at least 70 percent cacao can be a stress-reliever when you have a busy day at work. It is best paired with your favorite nuts, dried fruit, or any protein to help you feel full. While magnesium may make you feel sleepy, in small amounts, it can help you relax. It is also full of flavonoids, which help you mentally by helping your brain with learning, memory, and focus. Seeds are a quiet, non-messy, and easy-to-store snack; just keep it in an air-tight container to avoid ants. You can choose from pumpkin, sesame, sunflower, and flax seeds, which have antioxidants, a source of magnesium, zinc, copper, and iron. These minerals could help alleviate migraines and cognitive decline. 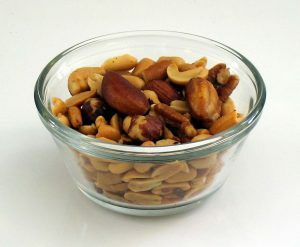 Nuts can improve your brain and heart health. One 2014 review found that nuts could improve cognitive function while sharpening memory. You can choose from a variety of nut types, some of which could be paired with yogurt, fruits, and other snacks. If you don’t like the monotony of chewing on the same snack, you can create your own healthy trail mix by pairing it with seeds, dark chocolate chips, or dried fruit. Keep your popcorn healthy by avoiding butter or fat-based ingredients. Simply add a quarter cup of kernels into a bowl, cover it with a plate, and pop it in a microwave for three minutes. Ditch the artificial cheese powder in favor of healthy spices like turmeric, which has antioxidants and improves brain power. Light and small salad servings can be a filling snack. Like all salads, you can add in vegetables you like such as lettuce, tomatoes, chickpeas, and more. For a nutritious salad that will help you get through the workday, we recommend a tuna salad. Tuna is a source of omega-3 fatty acids, which could help your cognitive health, memory, and mood. While these snacks are healthy, organic, and nutritious, remember to eat these in moderate amounts. Snack calories still count on your daily intake, so limit your daily snack to two hundred calories a day.As much as possible, avoid eating too much while at your desk. According to nutrition experts, eating snacks at your desk may become an unhealthy habit. When you eat snacks while working, you could be prone to“mindless eating.” Your brain isn’t fully aware that you are eating, so you may be consuming more calories than needed. And it’s this habit that causes people to compensate by eating less or later for their next meal, but this has no effect. A study conducted in France found that people eat the same amount of calories for dinner whether or not they choose to compensate for their afternoon snack. The best way to avoid these added calories is to avoid unhealthy snacks. Ditch the cookies and chips and munch on fruits and nuts if you feel the need to chew on something. You can still maintain a healthy lifestyle on the job by opting for organic and nutritional snacks that provide nutrients that are beneficial while you work. However, moderate your intake and, as much as possible, have your lunch break elsewhere to avoid staying at your desk the whole day. But if you really need to eat a snack, try one of our healthier suggestions.